Darren Tate needs no introduction and this double A release shows exactly why he is still at the top of his game when it comes to breathtaking and memorable music. 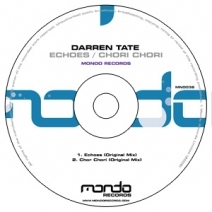 Echoes is a massive big room trance work out that has been smashed by the likes of Tiesto, Ferry Corsten, Above & Beyond and Matt Darey to name a few. On the flip Chori Chori is just as stunning but takes things on a more progressive tip.